If you’re looking to connect with influencers based on a specific topic of influence, you can do so by using Klout’s Search feature. Take this a step further and curate a Klout list of these influencers for future campaigns. Log in to Klout.com using the sign-on in the upper-right corner of the screen. Using the search field at the top of your screen, type in a one-word topic and press the Enter key (or click the magnifying glass). A new page populates containing the top influencers in that topic as well as the top Moments related to that topic. Select any influencer and view her profile by clicking the icon containing her avatar. If you wish to group certain influencers together for future reference, consider making a list on the Friends page. To make a list, you need to know a user’s Twitter name. To streamline this process, you might want to have two browser windows open at the same time, one with your search results and one with the list you’re creating. 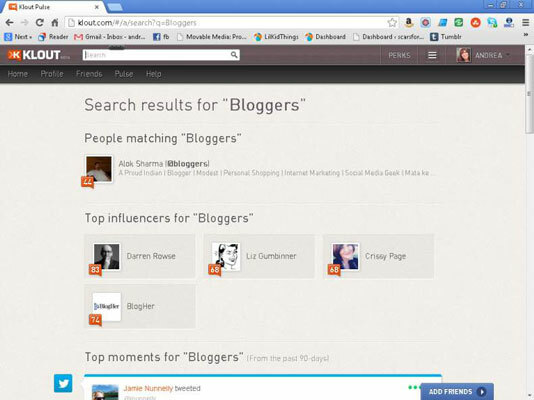 Hopefully in the future, Klout will add an “add to list” feature to every influencer’s profile. But that’s currently not the case. Gather the Twitter names of the influencers you wish to add to your new list. 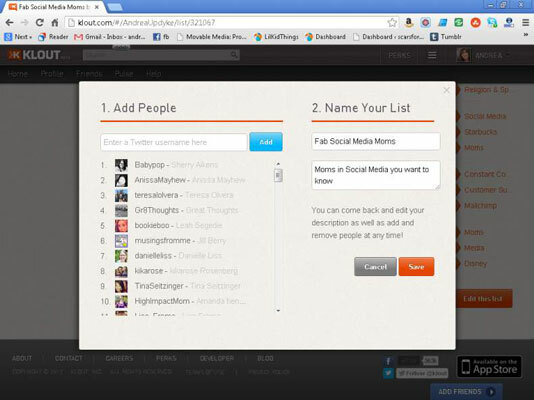 Log in to Klout using the sign-in button in the upper-right corner of the screen. Open the Friends page by clicking Friends on the navigation menu. 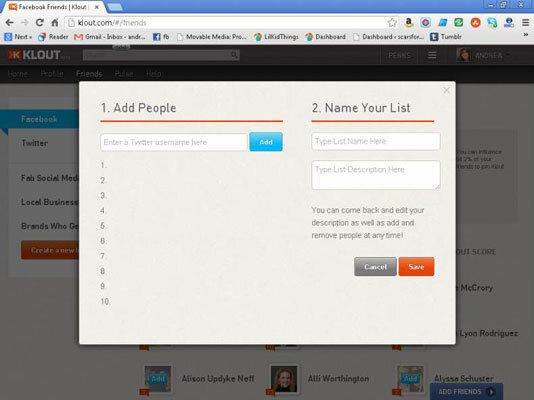 Open the list function by selecting the orange Create a New List button. Add influencers to your list by typing their Twitter names in the Add People field and clicking Add. Don’t include the @ symbol with the influencer’s Twitter handle. Name your list and add a description if desired, and save your list by clicking Save. You have now created a new list that appears in the sidebar on the left of your screen. You can edit this list at any time by opening the list and clicking Edit. Another feature you’ll notice after you create your list is the addition of Klout topics and the opportunity to endorse influencers in these topics. This is a great way to show appreciation to an influencer and help him increase his Score.